Known as mademoiselle George. She was the daughter of the leader of a travelling theatre group. Her father was a tailor of German descent, who later in life became the leader of the orchestra of the theatre in Amiens. She was already on the stage when she was five years old. The opera singer Madame Dugazon (1755-1821) took her to Paris for an education and in 1802 she debuted at the Comédie Française. Shortly afterwards she became Napoleon's mistress, but this came to an end after he had become emperor. Afterwards she had affairs with the dancer Duport and with Alexander Count Benckendorff. She was very succesful and only rivalled by Joséphine Duchesnois. In 1808 she left for St. Petersburg together with Duport, invited by Benckendorff. By going to Russia she broke her contract in Paris, but she had a few succesful years there. She left the country after Napoleons invasion had failed. In 1813 she performed in Dresden at the time Napoleon was also in that city. She also performed in Stockholm and then returned to the Comédie-Française, where Duchesnois was still employed. In Paris she met Wellington and later she claimed that she had received 'protection' from Napoleon as well as Wellington. In Paris she refused many of the roles that were offered her and after engagements in England and Belgium she decided to leave the Comédie-Française and she worked at the Odéon in Paris from 1822 until 1840. In 1853 she left the stage, but in 1855 she returned for one appearance in "Britannicus", a free performance to celebrate the taking of Sébastopol. In later years she became fat. Jerome Bonaparte granted her a pension and Napoleon III paid for her funeral in 1867. 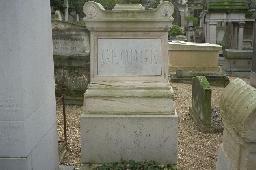 The grave of Marguerite George at Père Lachaise, Paris.